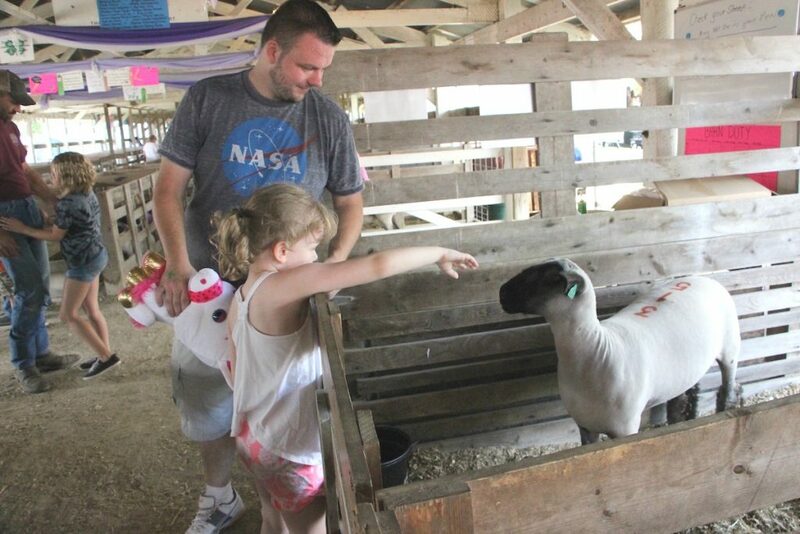 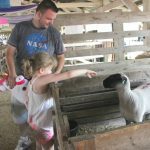 A woolly new friend Gary Willis took a stroll through the lamb barn at the Medina County Fair with his daughter, Emma, who couldn’t resist reaching in to pet a curious lamb. 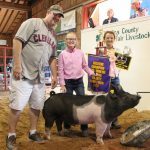 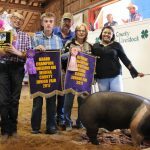 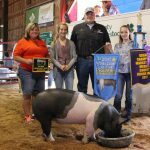 The Medina County Fair reserve champion market hog and champion homegrown hog, weighing 264 pounds, was shown by Chrystyanna Olson and purchased by Dewayne and Vikki Campbell of Funny Farm Designs for $13.05 a pound. Also pictured Zach Schroeder and Griffin Throckmorton. 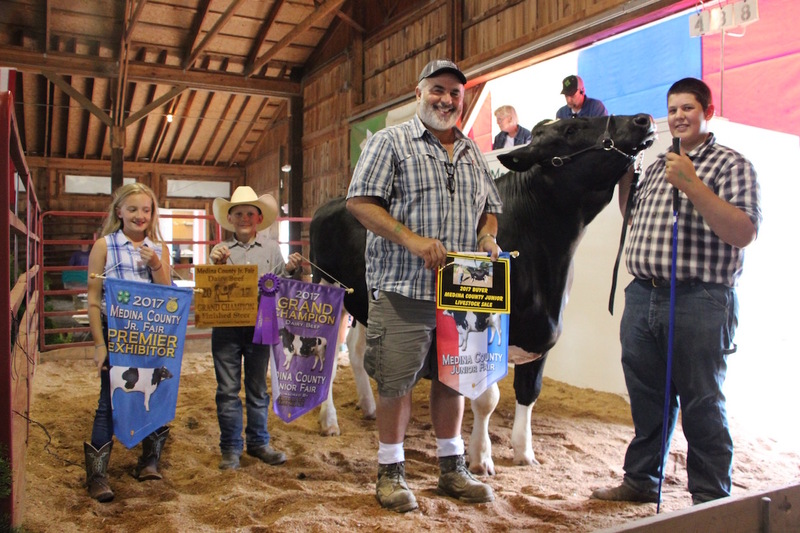 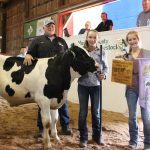 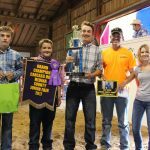 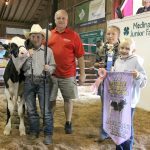 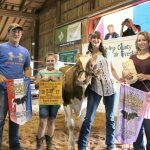 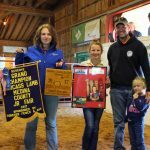 The Medina County Fair reserve champion dairy steer, weighing 1,455 pounds, was shown by Cheyenne Honigman and purchased by Treemaster’s Tree Service, represented by Jeff and Jaxson Bumbulis for $1.65 a pound. Also pictured Jamie Demeulenaere. 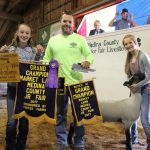 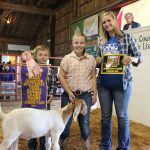 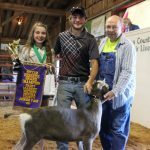 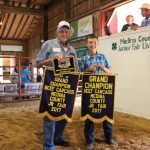 The Medina County Fair grand champion market goat, weighing 73 pounds, was shown by Jenna DeSimone and purchased by Westfield Insurance, represented by Nathan Nieschwitz, for a new record of $19 a pound. 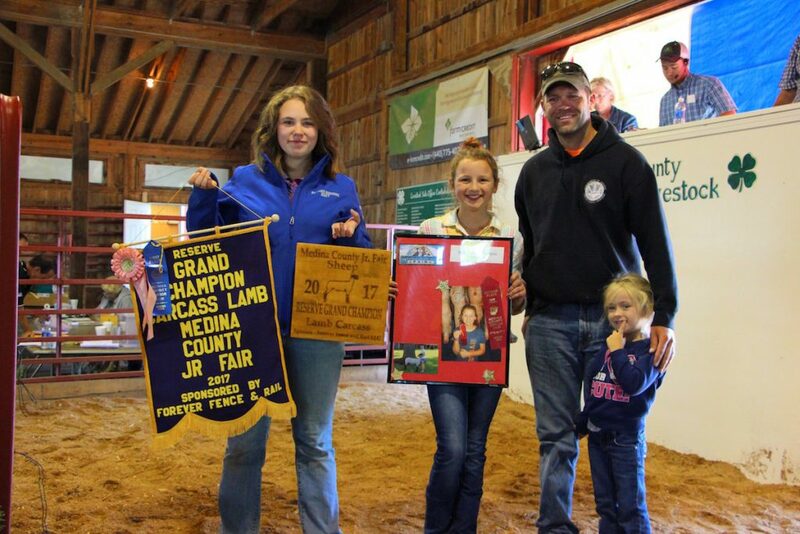 Justin, Katie and Brian DeSimone also pictured. 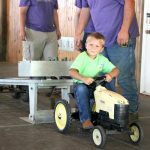 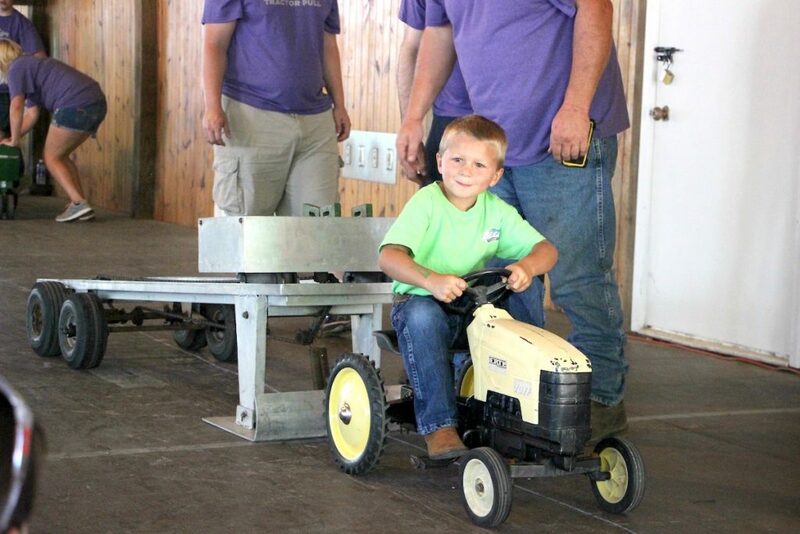 Jack Marvin, 4, gets a full pull in the 3- and 4-year-old division of the Medina County Fair kiddie tractor pull Aug. 5. 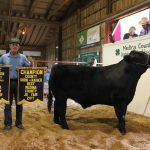 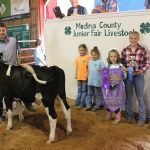 The Medina County Fair grand champion starter calf, weighing 385 pounds, was shown by Joseph Mennell and purchased by Shaw Farms for $2.50 a pound. 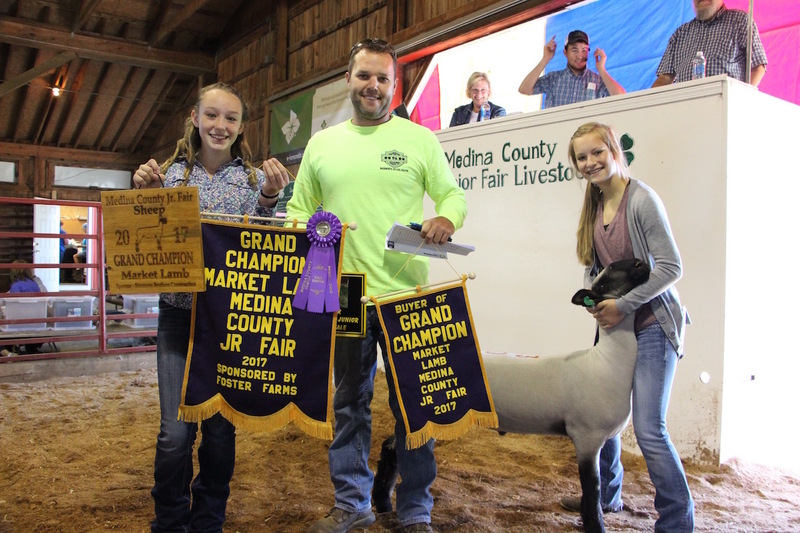 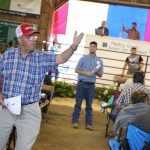 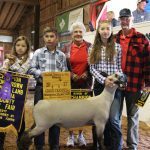 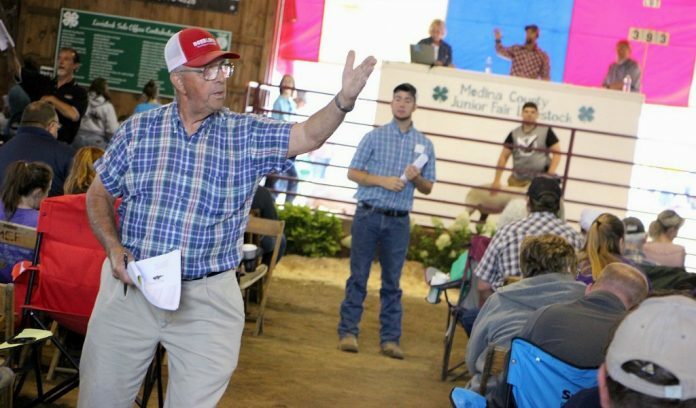 The Medina County Fair reserve champion homegrown lamb, weighing 148 pounds, was shown by Larry Lewis III and purchased by Jeff Miller and Family for $3.90 a pound. 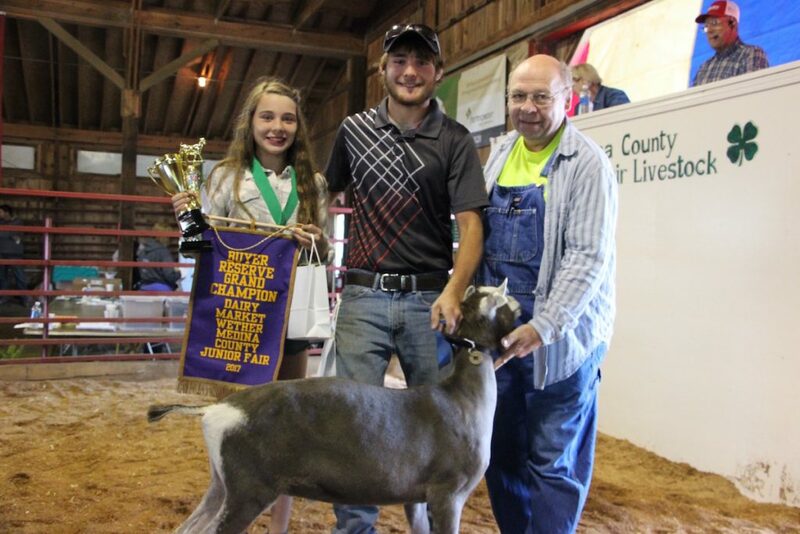 Also pictured Jake Mennell. 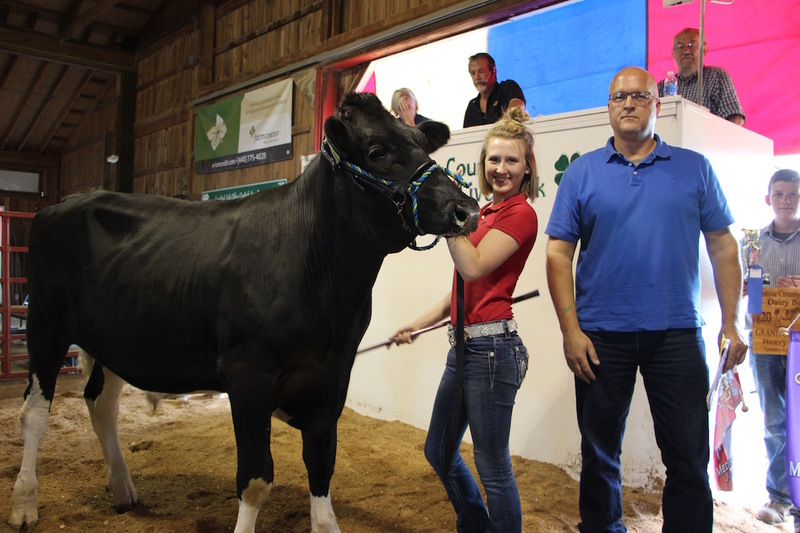 The Medina County Fair reserve champion heavy feeder calf, weighing 685 pounds, was shown by Anna Farnsworth and purchased by Tom Keller of T.L. 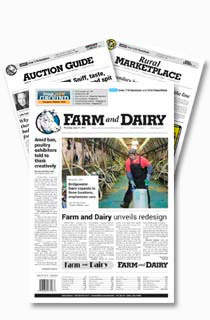 Keller Meats for $2.40 a pound. 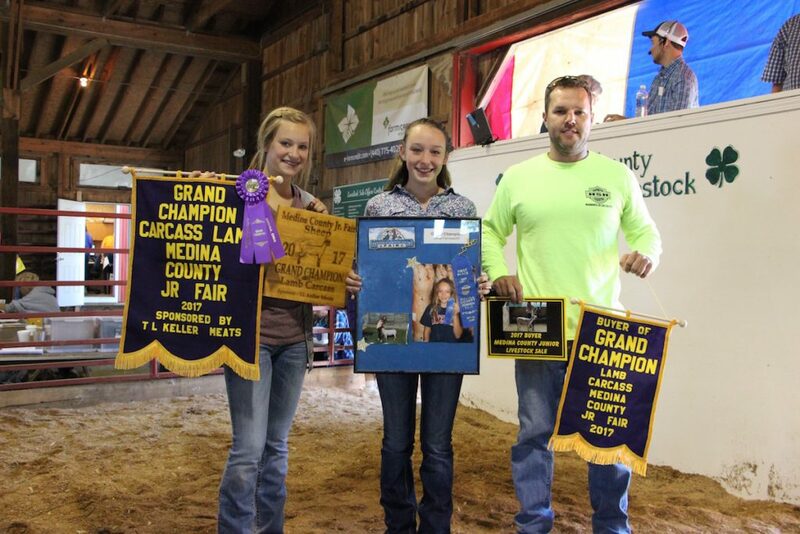 Also pictured Allison Loftis. 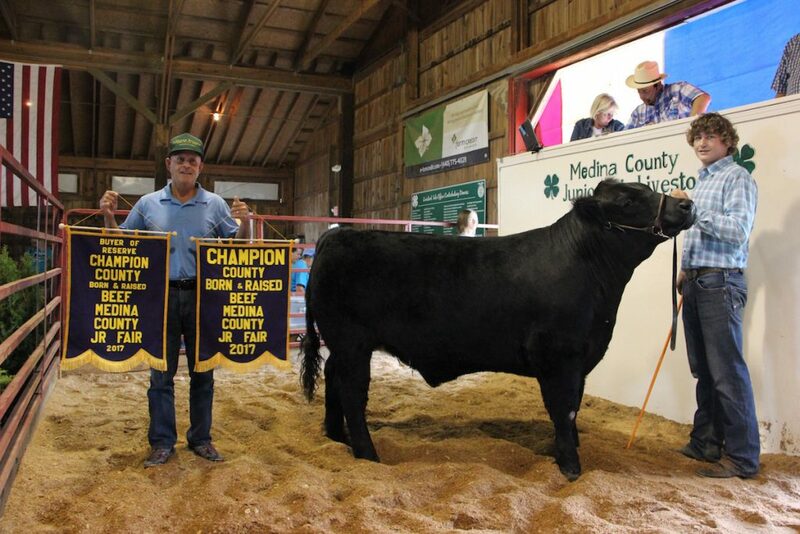 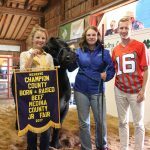 The Medina County Fair grand champion county born steer, weighing 1,275 pounds, was shown by Joey Pavlovicz and purchased by Farmers Savings Bank, represented by Tom Lee, for $3.10 a pound. 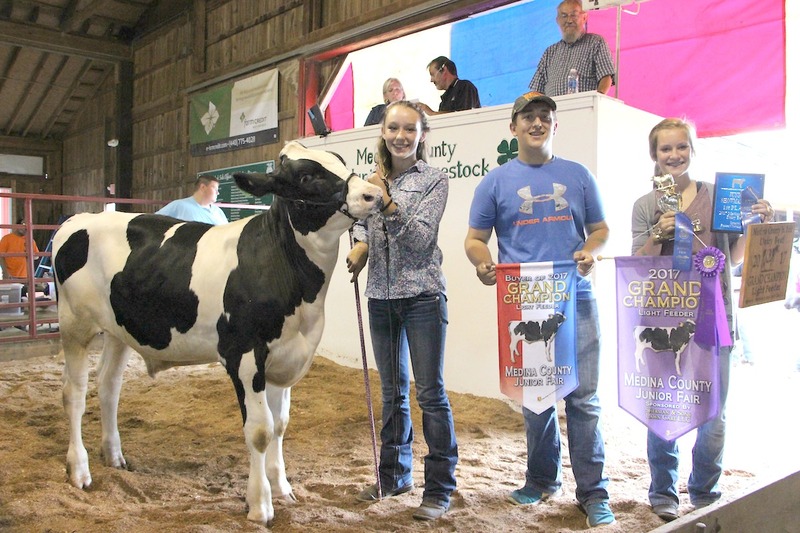 The Medina County Fair grand champion market steer, weighing 1,305 pounds, was shown by Natasha Marrone and purchased by Ryan Gregoire of Ag Design for $4.75 a pound. Also pictured Laci Alkyer. 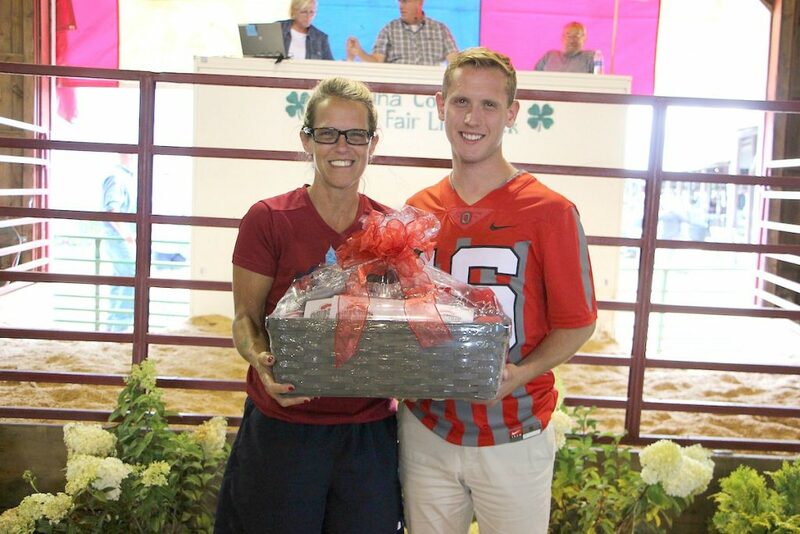 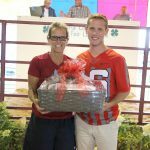 Dr. Kelly Parker purchased the 4-H Endowment Basket for a new record of $5,000. 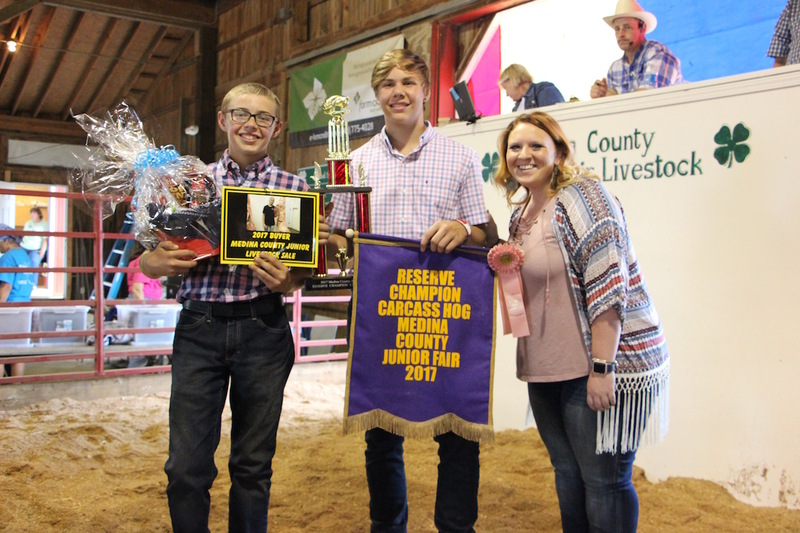 Also pictured Caleb Parker. 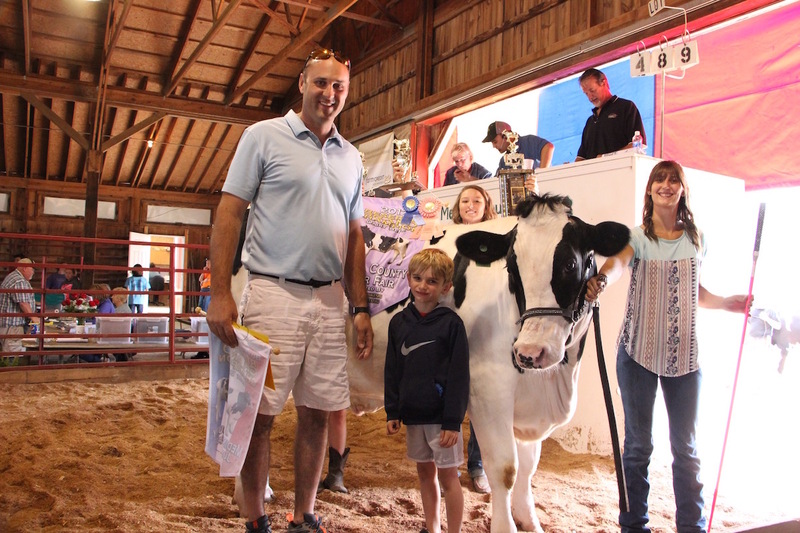 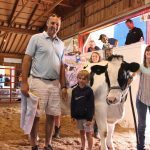 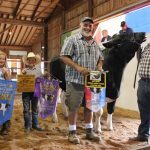 The Medina County Fair grand champion dairy steer, weighing 1,695 pounds, was shown by Larry Lewis III and purchased by Mark Albrecht of Albrecht Trucking for a new record of $3.65 a pound. 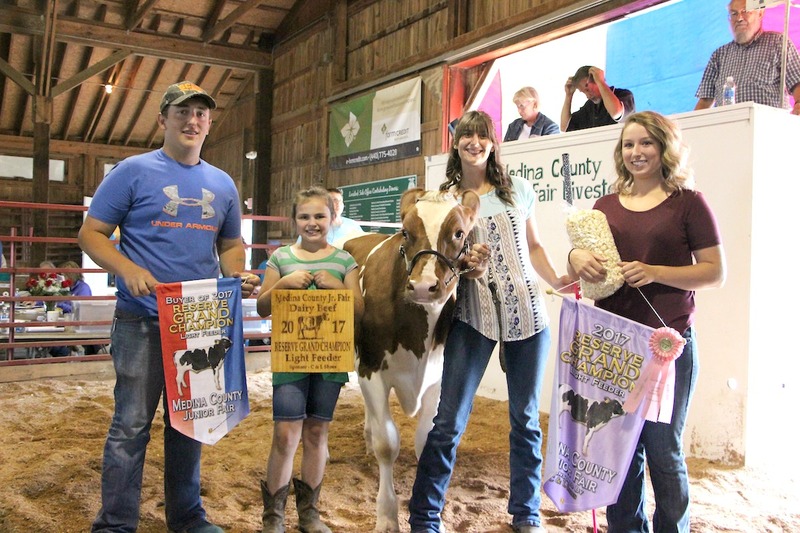 Also pictured Macie Dickerson and Jake Mennell. 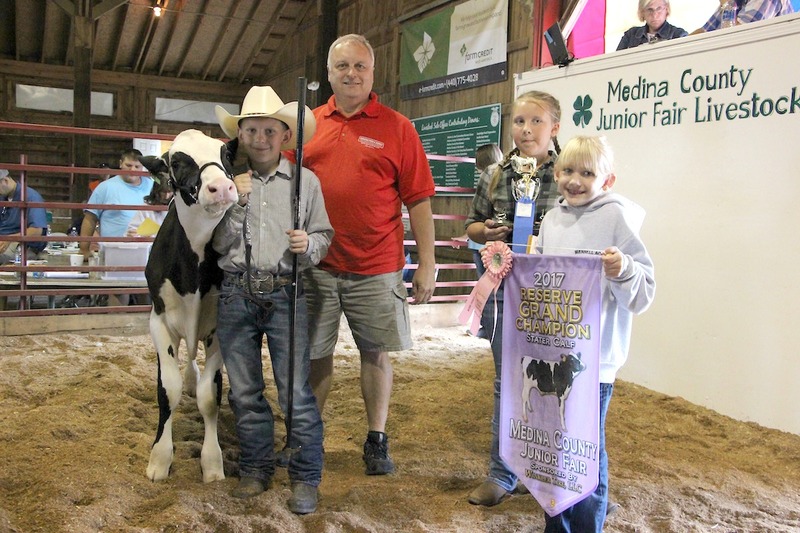 The Medina County Fair grand champion light feeder calf, weighing 600 pounds, was shown by Anna Farnsworth and purchased by Shaw Trucking and Excavating, represented by Landon Hollopeter, for $2 a pound. 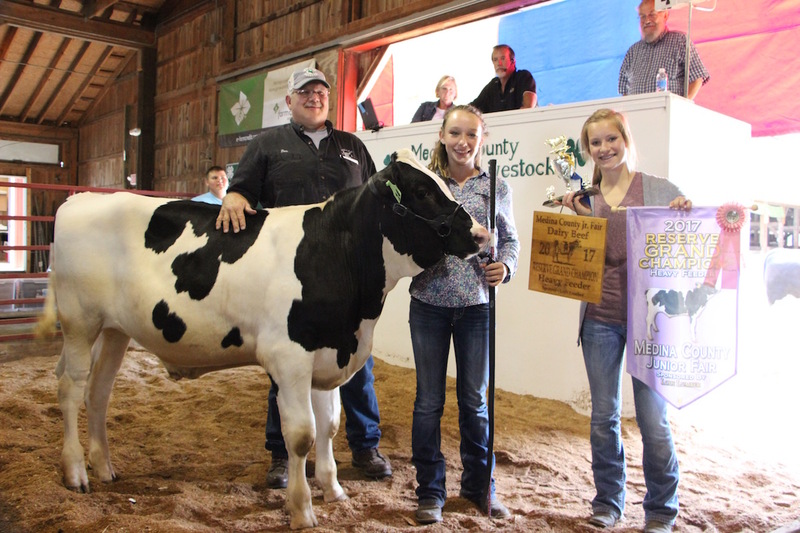 Also pictured Allison Loftis. 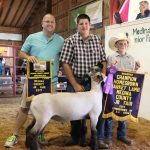 The Medina County Fair reserve champion dairy goat, weighing 75 pounds, was shown by Jared Bartter and purchased by Dr. Charles Pfister for $7 a pound. 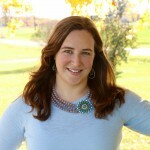 Shannon Barter also pictured. 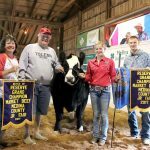 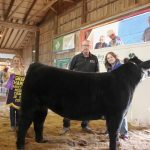 The Medina County Fair reserve champion market steer, weighing 1,415 pounds, was shown by Shelby Moucha and purchased by Mike and Deb Terrell for $3.90 a pound. 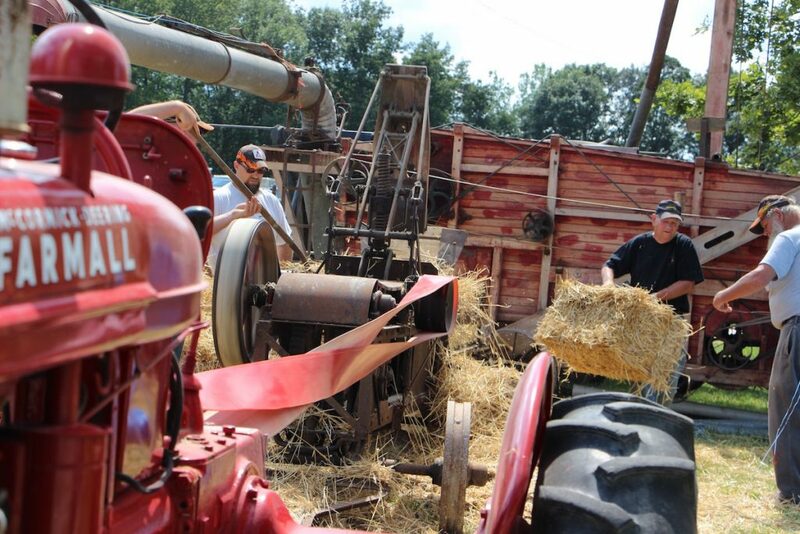 Andy Walther also pictured. 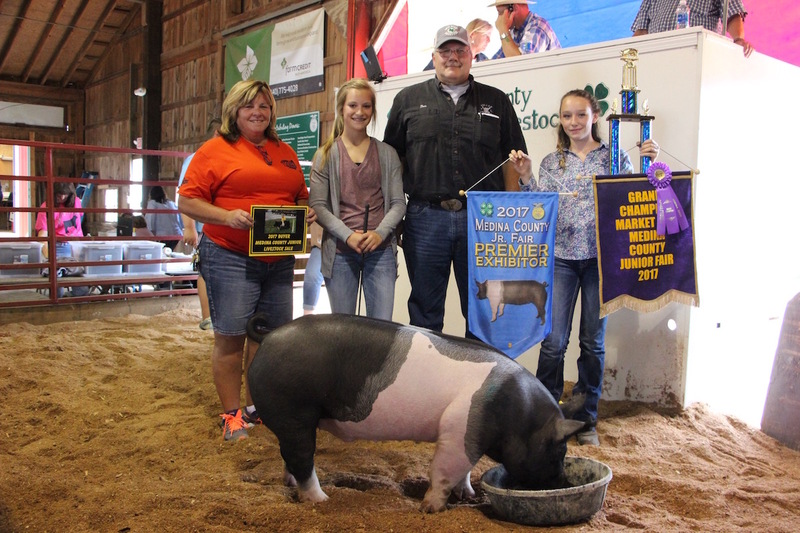 The Medina County Fair grand champion market hog, weighing 272 pounds, was shown by Allison Loftis and purchased by Tom and Cathy Keller of T.L. 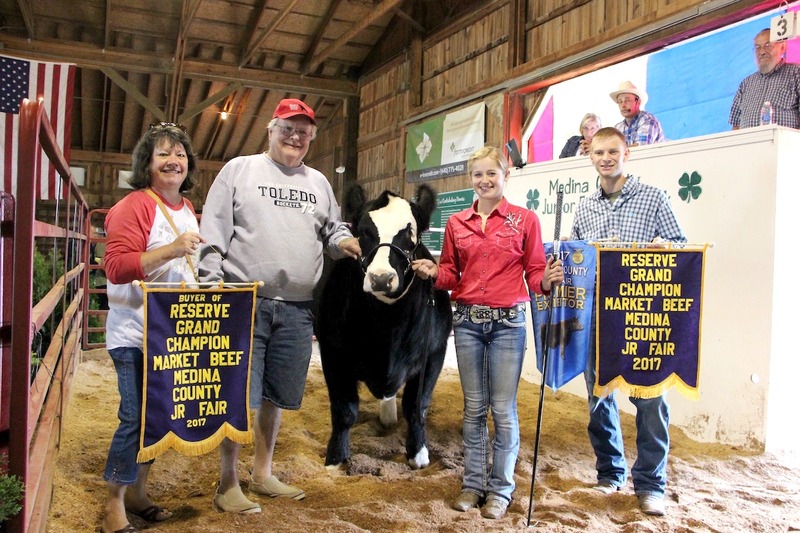 Keller Meats for $7.50 a pound. 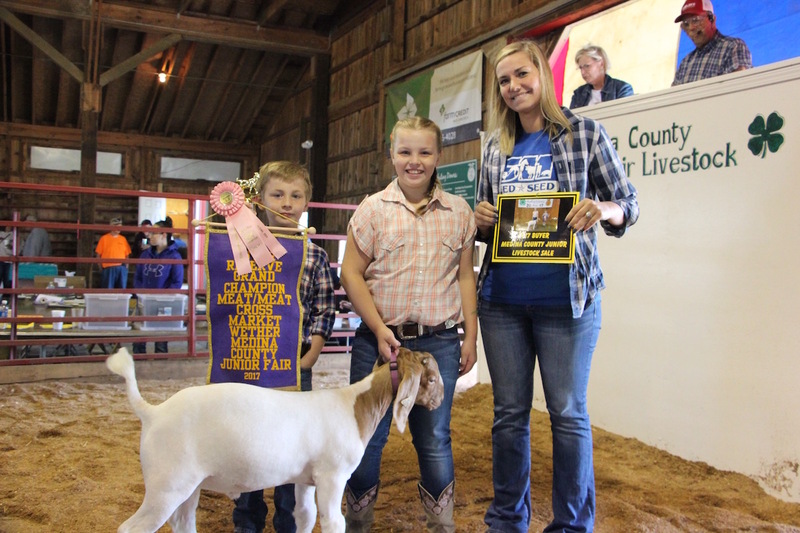 Anna Farnsworth also pictured. 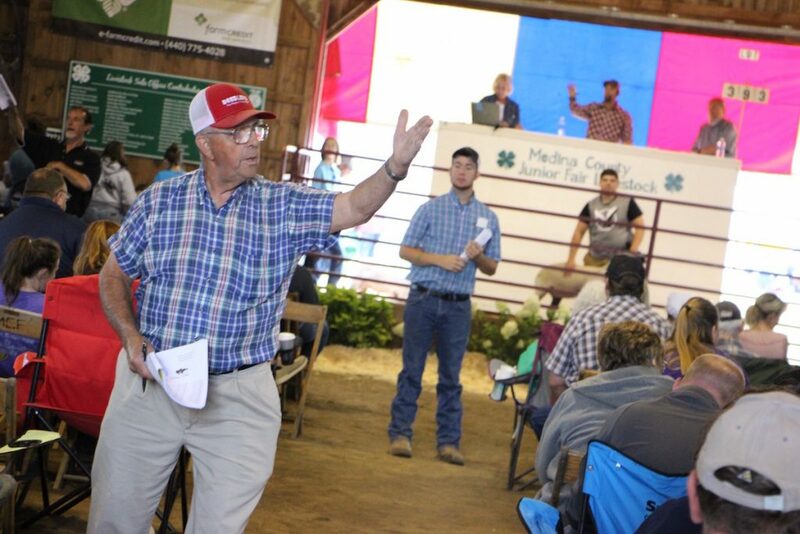 Harold Farnsworth catches bids during the Medina County Fair livestock auction Aug. 5. 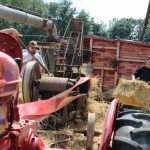 The Medina County Antique Power Association displayed an antique straw baler in action during the Medina County Fair Aug. 5. 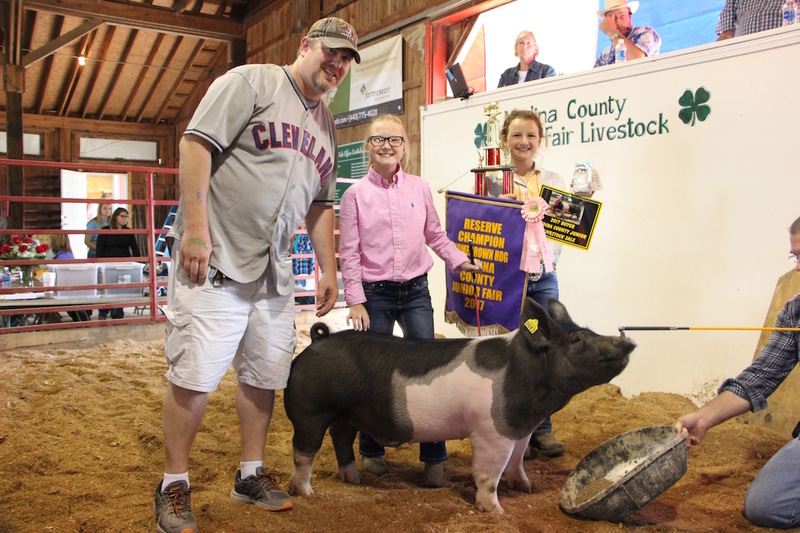 The Medina County Fair reserve champion carcass hog, weighing 168 pounds, was shown by Clay Johnson and purchased by the Kelling Family, represented by Karissa Kelling, for $6.20 a pound. 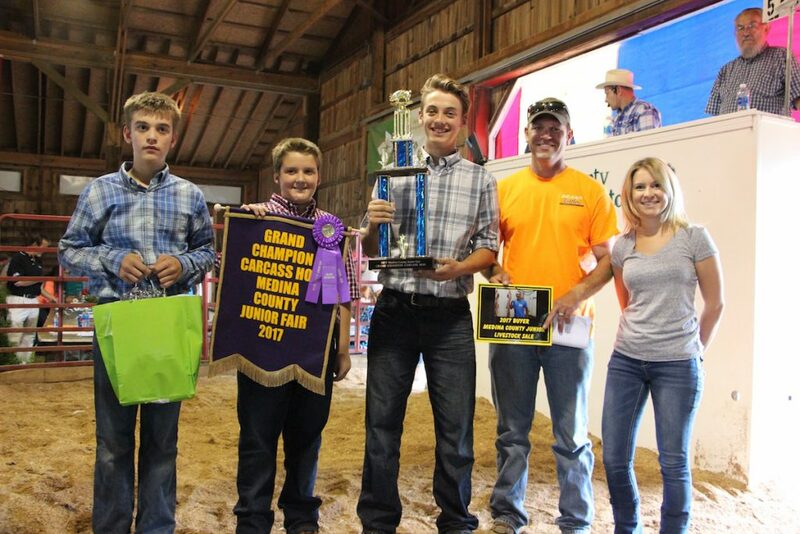 Also pictured Zach Schroeder. 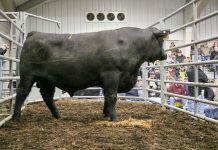 The Medina County Fair grand champion carcass steer, weighing 789 pounds, was shown by Levi Farnsworth and purchased by Don Simmons of Simmons Brothers Construction for $4.70 a pound. 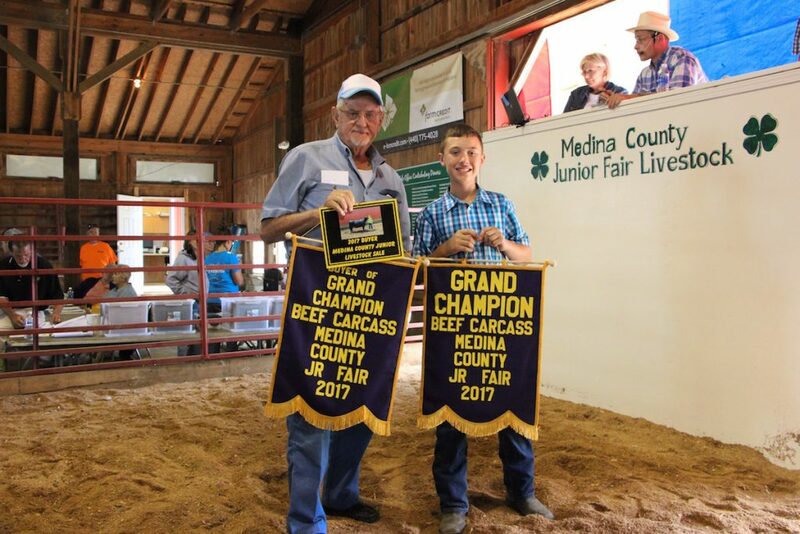 The Medina County Fair reserve champion starter calf, weighing 413 pounds, was shown by Jake Mennell and purchased by Spencer Feed and Supply, represented by Rob Hastings, for $2.50 a pound. 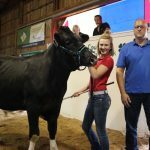 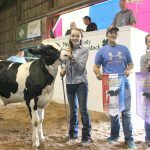 The Medina County Fair grand champion heavy feeder calf, weighing 1,100 pounds, was shown by Alexis Zgrabik and purchased by Brian Fehlan of Fehlan Insurance for $2.60 a pound. 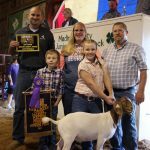 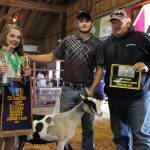 The Medina County Fair grand champion dairy goat, weighing 71 pounds, was shown by Jared Bartter and purchased by Fairway Electric, represented by Howard Call, for $10 a pound. 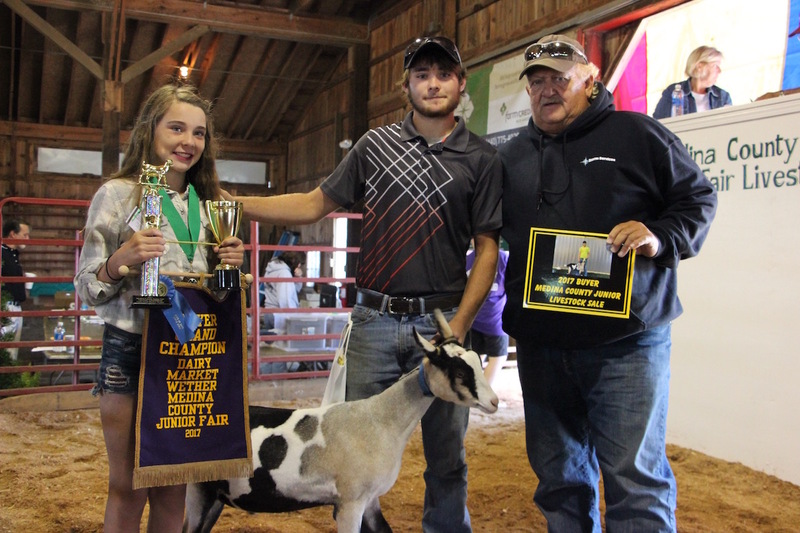 Shannon Barter also pictured. 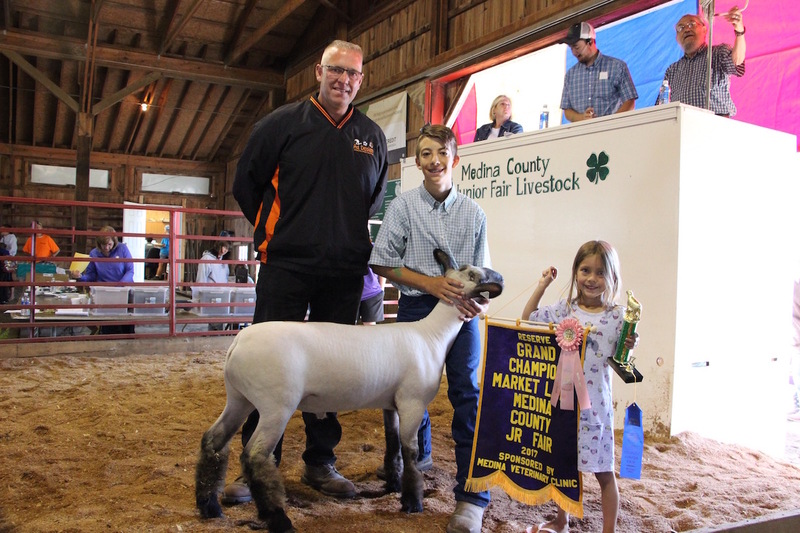 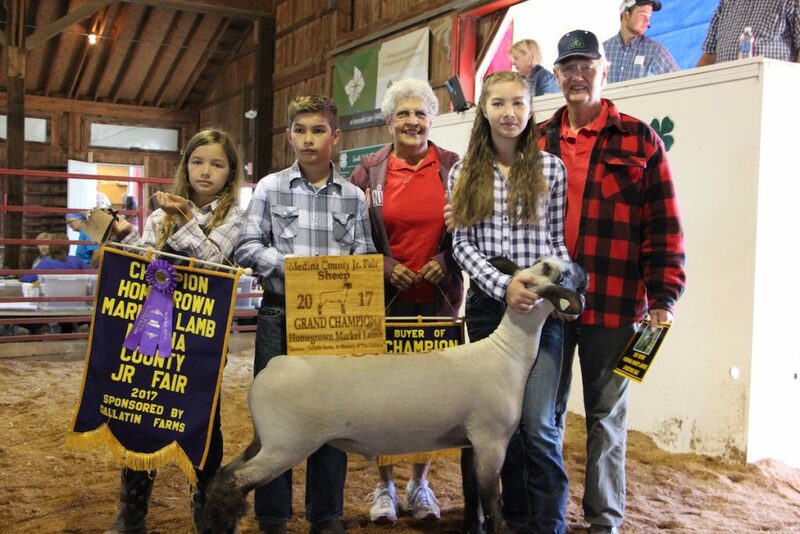 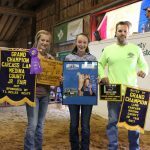 The Medina County Fair grand champion carcass lamb, weighing 84 pounds, was shown by Anna Farnsworth and purchased by HSH Construction and Excavating, represented by Dan Vinez, for $11 a pound. 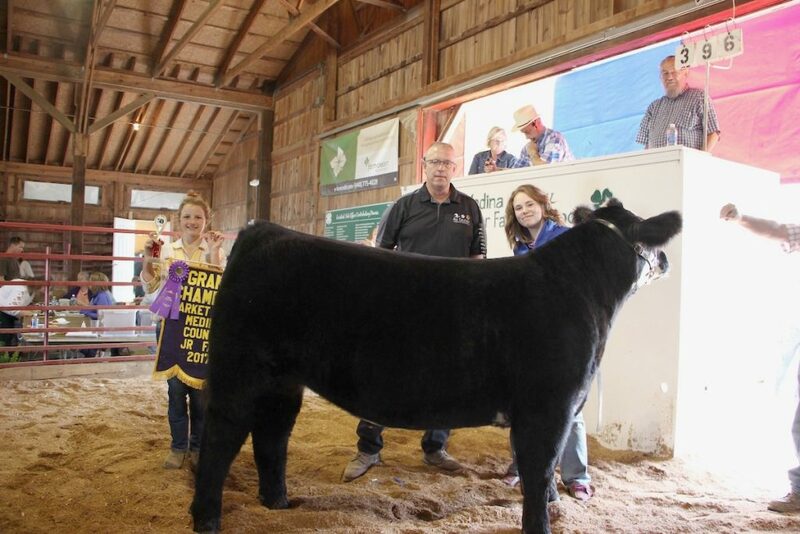 Also pictured Allison Loftis. 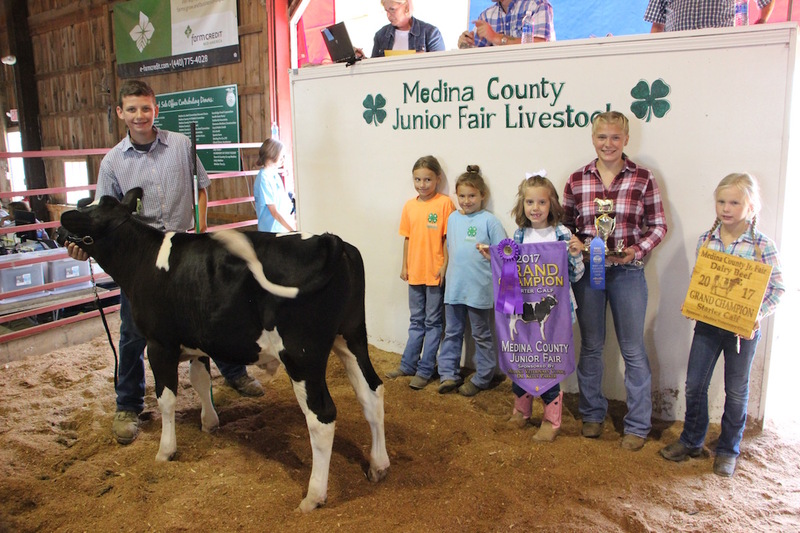 The Medina County Fair reserve champion light feeder calf, weighing 650 pounds, was shown by Cheyenne Honigman and purchased by Dr. Whitney Shaw, represented by Landon Hollopeter, for $1.90 a pound. 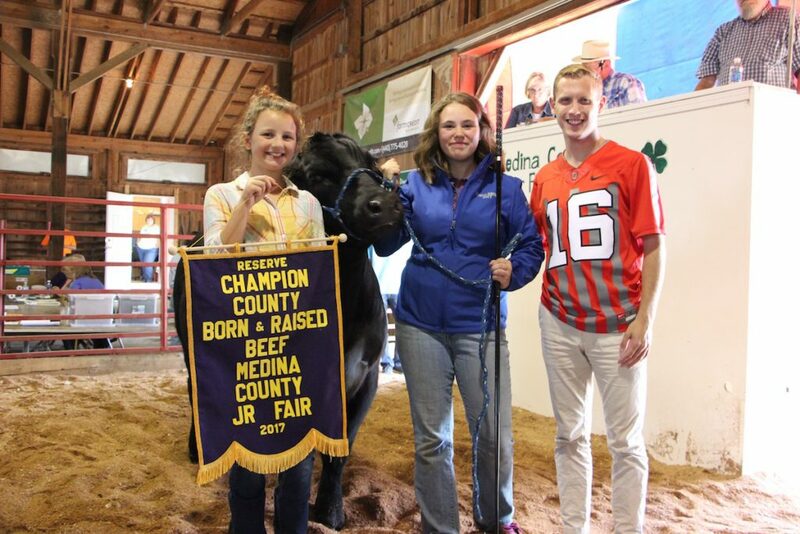 Also pictured Jamie Demeulenaere and Izzie Honigman. 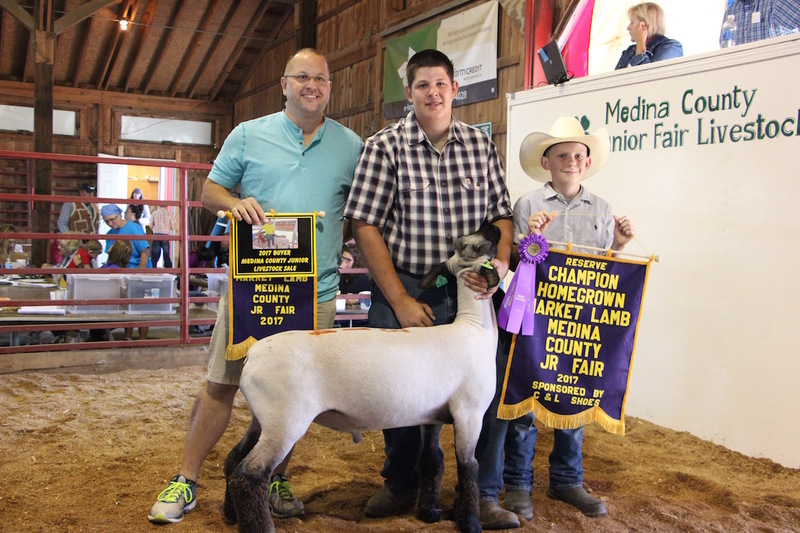 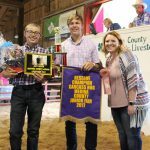 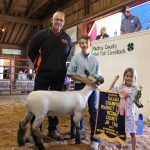 The Medina County Fair reserve champion market lamb, weighing 134 pounds, was shown by Clayton Sparks and purchased by Ryan Gregoire of Ag Design for $15.50 a pound. Also pictured Tessa Sparks. 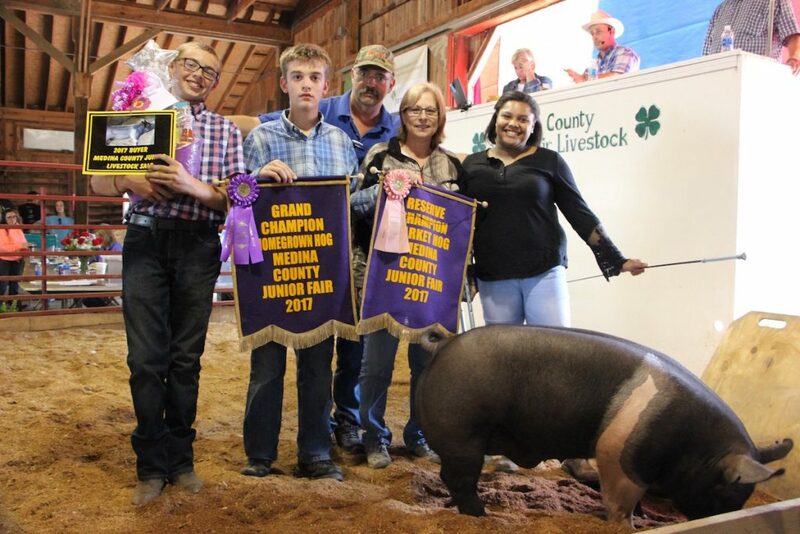 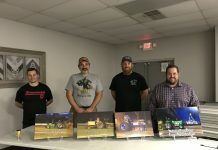 The Medina County Fair grand champion carcass hog, weighing 143 pounds, was shown by Zander Throckmorton and purchased by Jason and Jessica Sulzener of Precision Outdoor Creations for $6 a pound. Also pictured Griffin and Elliot Throckmorton. 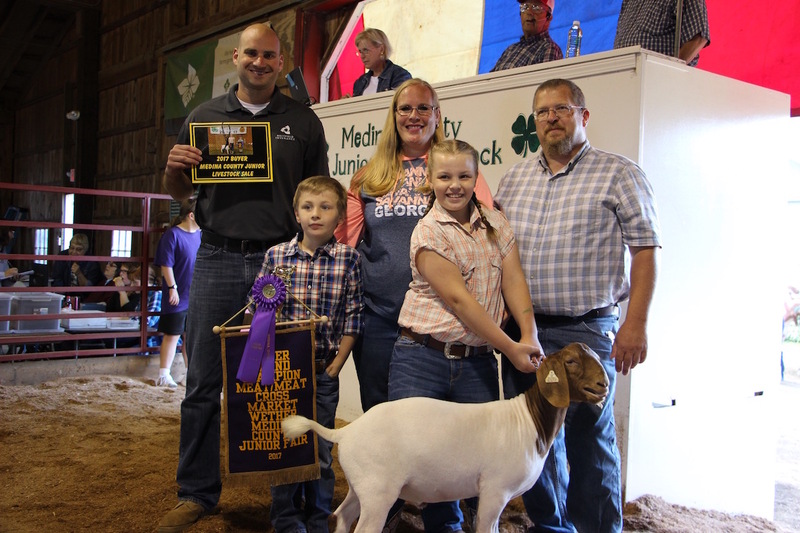 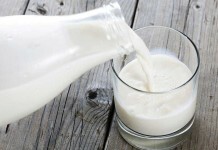 Buyer: Jeff Miller and Family.